Second Harvest has been dedicated to rescuing fresh and perishable food since 1985 but despite many awareness campaigns are still underfunded. Help needs to come from not only citizens but the federal government. Canadians are woefully unaware of the current scale of food wastage that goes on behind closed doors. We wanted to take this hidden waste and put it on display so that Canadians can really see what's going on in our landfills. Without citizen support the government will not make this a priority issue. A coordinated guerrilla campaign in major cities focused on disrupting Canadian's expectations of what waste is. Bait and switch TV ad's featured a gourmet chef throwing out perfectly prepared meals and a focused direct mail campaign served to drive the point home and rally online support. 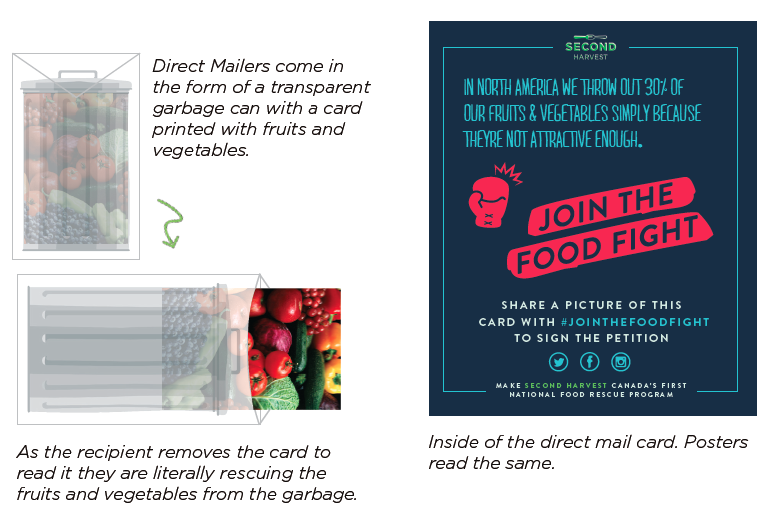 By collecting digital signatures to an online petition in the form of tweets and facebook posts, Second Harvest makes it easy and instant to get involved. The campaign culminates by publicly aggregating and forwarding hash-tagged signatures to Canadian government members and displaying their responses for all to see.